The traditional Jerusalem Day flag parade celebrating the city's reunification sparks a tweet comparing the march with neo-Nazis in Skokie. The traditional Jerusalem Day flag parade celebrating the reunification of Israel's capital sparked one tweet comparing the march with neo-Nazis in Skokie. The parade, which moves around the entire Old City of Jerusalem and then through and around from one side to the other, culminates at the Western Wall Plaza, where there will be singing, dancing, speeches and concerts. The march takes place in two separate groups, divided by gender, both of which will be monitored by security personnel in order to ensure no violence breaks out. 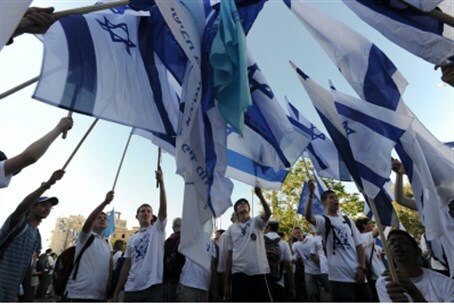 Tens of thousands of marchers, many of whom were members of national religious Zionist organizations, were present last year to celebrate the unification of Jerusalem. The spokesperson for the English-speaking division of the Yisrael Beytenu party, called the neo-Nazi comparison “absolutely outrageous,” saying it reflected “an ill-informed, insensitive and extremist point of view.